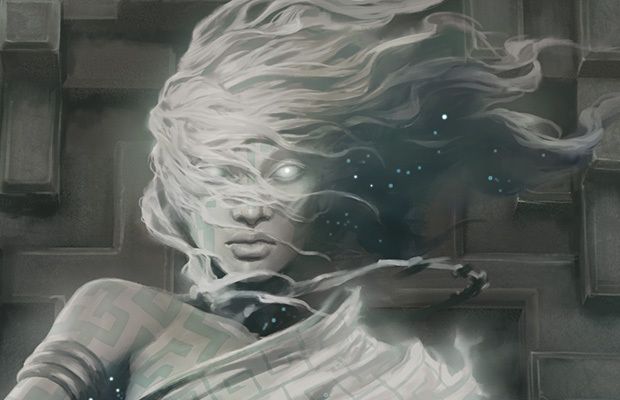 To date, Jason Chan has created sixty-eight fantastic pieces of art used on Magic cards, and one token. In Theros block, thus far, he has given us both Xenagoses... Xenagi... (This is why I'm a designer and not a grammarian!) These are even more spectacular when you get to see the level of detail involved. His use of light is masterful and his compositions are always very well balanced. Action: This is a Planeswalker, one of Magic's iconic, world-traveling mage characters. This Planeswalker is a male satyr. He's known for magic that stirs up passionate emotions—rage, lust, zeal. 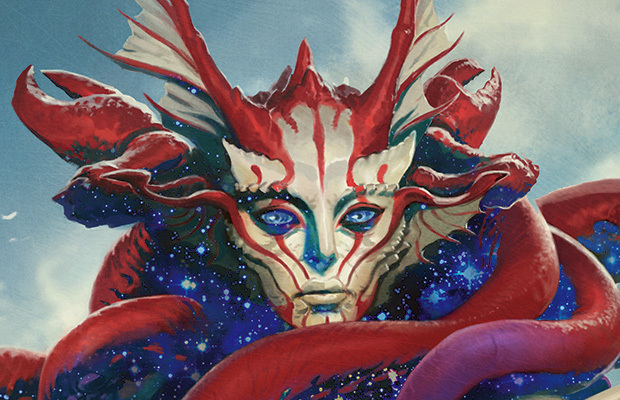 Xenagos will eventually become the central villain of this world—his ultimate ambition is to become a god (and he will, in the next set!). We'd like this piece to illustrate his "before" state, when he's a powerful spellcaster but still mortal (that means no star-field in his design). Later we'll see him in his "god" state, which will show him in his exaggerated, Greek-god state. Maybe in this piece, we see him beckoning the viewer toward him, tempting us with a twinkle in his eye. 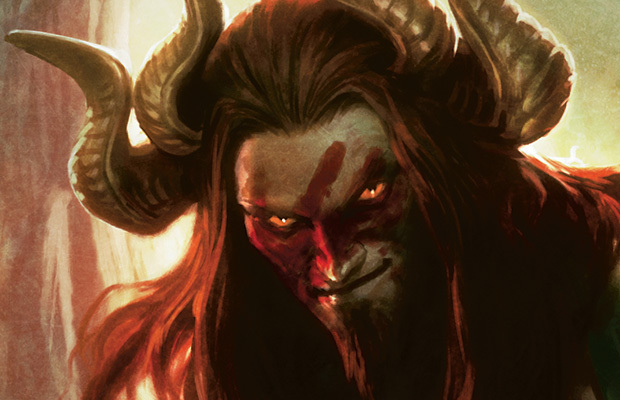 Focus: Xenagos, the satyr Planeswalker. Mood: A gregarious trickster with a dark ambition. Action: Show Xenagos, the mortal satyr who has achieved godhood through exploiting the passions and emotions of his followers. 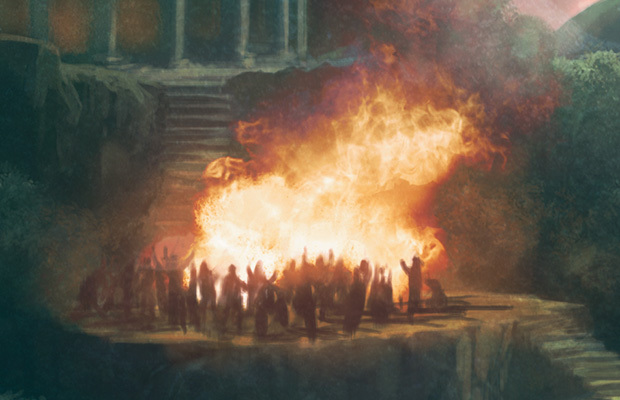 He is the god of revels—chaos and ecstasy are his mandates as he whips the plane of Theros into a wild, hedonistic frenzy. He is cocky, confident, and chaotic with a double dose of animal magnetism. He is a god, so where he is in shadow, those places fall off into Nyx starfield. Perhaps he is holding his spear and his kylix—up to you. Maybe there is "smoke" rising up from the kylix that he is holding and that smoke is done with the Nyx "starfield" effect—if it looks cool. Feel free to play. For the Nyx "starfield" effect, it would be cool to have some "major" stars in the starfield to capture the feeling of "constellation." 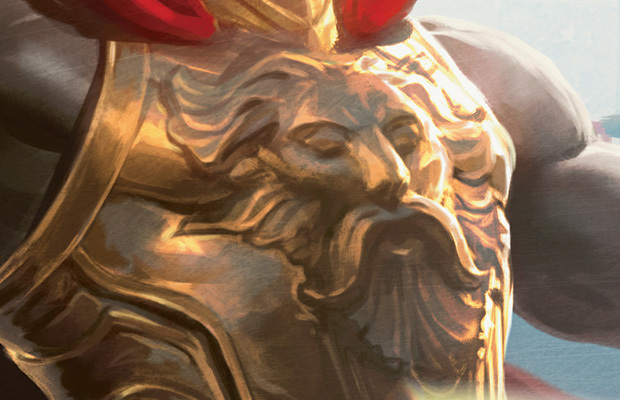 Focus: Xenagos, the god of revelry. Mood: "Come, lose all your self control, be free and join the party." Notes: He has successfully catapulted himself into godhood, and that's how darkly pleased with himself he should seem. In addition, we have three other pieces from Chan. We saw one of them last week but let's take a much closer look at these. Click to switch between views.